D'Alembert betting system, also known as the "Pyramid system", was introduced in mid 1700s by a French mathematician Jean D'Alembert. 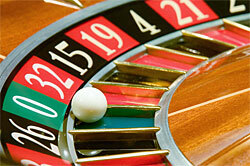 It has become in fact one of the most famous and popular roulette betting systems. D'Alembert system largely relies on the idea that every player's loss is followed by a win, and, vice-versa, every win is followed by a loss. This idea is known as "Gambler's fallacy" and assumes that every individual spin of the roulette wheel has its own history that connects it to previous spins. In fact, every given spin of the wheel is an independent and unique event that has no history as it is always random. This idea makes the use of the D'Alembert system, just like most other betting systems, quite useless. The player makes an outside bet of any size. The system actually works only with outside even-money bets like Black/red, Odd/Even or Low 18/High 18. Make sure that you bet on the same item during the whole game. It is also recommended to make medium size bets in the first place, so that the player is able to reduce the bet for several times before nothing is left. For example, if you bet $20 and then deduce $1 each time you win, you will be able to reduce bets 19 times before your original bet amount is over. According to the "Gambler's fallacy", if your bet wins it must be followed by a loss, so the size of your next bet should be smaller so that you lose less. So you must subtract 1 unit from your bet each time you win. If your bet loses, it is supposed to be followed by a win, so increase the size of it by one more unit. For example, with the first $10 bet won, you deduce $1. Your next bet will thus make $9. If this bet loses, add $1 to it and make a $10 bet again. With another loss add one more dollar and make an $11 bet. If it wins, you will get a total profit of $10. First of all, D'Alembert system presupposes that the player's bets will not grow too fast, as they do in the Martingale system. This means that with this system a player will not exceed the table limit and his or her bankroll. D'Alembert system leaves a chance for the player to stop at any moment of the game either to gather the winnings and quit or to reduce the losses. The main disadvantage here lies in the very nature of the assumption that the player wins or loses consecutively. As it was mentioned above, this assumption is a fallacy based on a roulette game myth claiming that the roulette game results are not random. In fact they are, and no possible record of previous results at a roulette table can be made. It turns out that the chances the even-money bet wins are not equal. There always exists house edge - the advantage of the casino over players that occurs due to the presence of a zero slot (or even two zero slots - '0' and '00' in the American roulette). The house edge in American roulette makes about 5.3% in the American and about 2.6% in European roulette variant.